This article is about the American movie. For the bus operator, see The Big Bus Company. 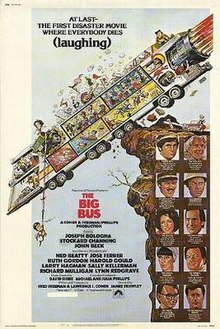 The Big Bus is a 1976 American disaster comedy film starring Stockard Channing and Joseph Bologna, and directed by James Frawley. A spoof of the disaster movie genre (which was popular at the time), it follows the maiden cross-country trip of an enormous nuclear-powered bus named Cyclops. The Big Bus received mixed reviews at the time of its 1976 release, although the New York Times gave the film a favorable review. Box office sales were disappointing, but the film has since been recognized as a cult classic of its genre. Director Frawley won the audience award at the 1977 Avoriaz Fantastic Film Festival. Coyote Bus Lines' scientists and designers work feverishly to complete Cyclops, a state-of-the-art articulated jumbo bus, enabling man to achieve a new milestone in busing: non-stop service between New York City and Denver. Almost immediately after the bus's engine is equipped with nuclear fuel, a bomb goes off, critically injuring Professor Baxter, the scientist in charge of the project. Cyclops itself is undamaged, but Coyote Lines has lost both its driver and co-driver. Kitty Baxter, the professor's daughter and the Cyclops designer, is forced to turn to Dan Torrance, an old flame. Once a promising driver, Torrance was disgraced after he crashed his bus atop Mount Diablo, and was accused of saving his own life by eating all of his passengers. (Torrance blamed his co-driver for cannibalism, insisting that he himself survived by eating the seats and the luggage, and only ate part of a passenger's foot by accident.) Narrowly surviving an assault by vindictive fellow drivers with the help of "Shoulders" O'Brien, Torrance is recruited to drive Cyclops. Meanwhile, a sinister tycoon plots with oil sheikhs to destroy the bus. Known as "Iron Man," he is encased in a huge iron lung while directing his brother Alex to sabotage Cyclops using timebombs. Alex would prefer to use a manmade earthquake, but Iron Man insists that the bus be destroyed and discredited. Before its maiden voyage, Alex sneaks aboard and hides a bomb within the bus. Amid public fanfare, the bus finally leaves New York bound for Denver. Among the passengers are the Cranes, a neurotic married couple waiting for their divorce to finalize; Father Kudos, a priest who has lost his way; Dr. Kurtz, a disgraced veterinarian; Emery Bush, a man with only a few months to live; and Camille Levy, whose father died in the aforementioned Mount Diablo bus crash. At first, Cyclops' journey is a success, and Torrance triumphantly breaks the 90 mph "wind barrier" (referenced as "breaking wind"). Soon, however, disaster strikes. Investigating a mechanical problem, Dan finds Alex's bomb. He disarms it only before an explosion rips through another part of the bus. Now unable to stop, Cyclops speeds across America. Dan is determined to achieve Cyclops' historic goal of non-stop service to Denver, but he also needs to surpass a treacherously curvy road where his father died. Dan almost succeeds, but not before a truck collides into the upper deck windshield, and the bus runs partially off the road, finding itself teetering over a cliff. To save the bus, Dan and Shoulders shift all weight to the back of the bus by pumping all of the vehicle's storage of carbonated beverages into the opposite end of the bus into the galley, as well as jettisoning all of the passenger luggage. Knowing he has only one more chance to destroy Cyclops, Iron Man is finally persuaded by Alex to use the earthquake. Unfortunately for Iron Man, Alex has somehow set the coordinates for Iron Man's house instead. Back on the road, Cyclops is once again headed to its destination, when, only 25 miles outside of Denver, the front and rear halves of the bus split from each other. On the director's commentary of the 1980 film The Blues Brothers, John Landis reveals that he cast Murphy Dunne as the leader of "Murph and the Magic Tones" because he had seen him as a cheesy lounge singer in an earlier film. Although Landis doesn't mention The Big Bus by name, the film was Dunne's only previous performance as a lounge singer. The central set piece of the film is the bus itself—credited for the design is the film's art director Joel Schiller. The bus is a nuclear powered, double-decker, articulated bus with 32 wheels. It is named Cyclops due to the single large headlight prominent at the front. The front also features large wraparound windows on both upper and lower decks—with the lower deck containing the cockpit and the upper, front portion containing the lounge/bar. Cyclops requires the operation of a driver and co-driver. In the film, Cyclops has a passenger capacity of 110, is equipped with a bowling alley, Oriental-style cocktail lounge with a piano bar, swimming pool, captain's dining room, private marble-and-gold bathroom with sunken tub, and chef's kitchen. Exterior features shown are an automatic washing mechanism for the Cyclops exterior; an automatic en route tire-changing system; and a display of "Flags of all Nations," which emerges from the vehicle's roof. Cyclops can be compared to the German Neoplan Jumbocruiser, an actual double decker articulated super bus with a capacity of 170, originally built in 1975. 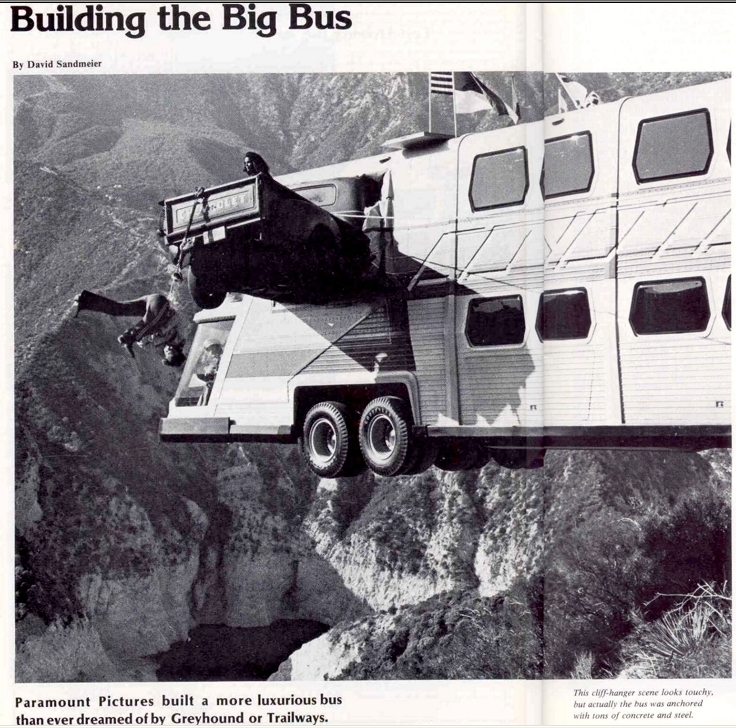 According to articles in 1976 issues of both Motor Trend magazine and the now defunct Bus World magazine, the real bus used in the film was a large road-worthy vehicle created by production designer Joel Schiller. Though the most visible front portions of the bus (bar and cockpit) appeared to be functional, the remainder of the body of the vehicle was mostly empty—containing only the engine, suspension and essential mechanisms used for exterior trick shots. 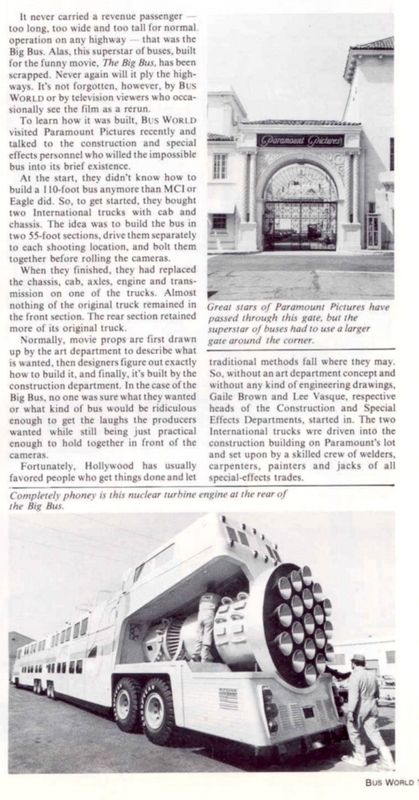 Few behind-the-scenes and construction photos or plans have surfaced, but according to Joel Schiller's web site, the actual bus built for the film was part of the Los Angeles Bicentennial parade in 1976. 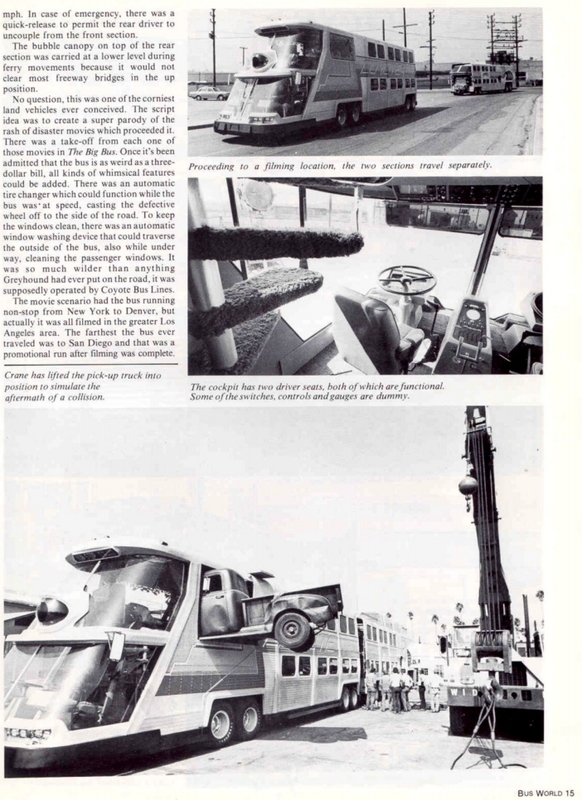 Further, the Bus World article stated that the vehicle made a trip from Los Angeles to San Diego, California, as a film promotion in 1976. 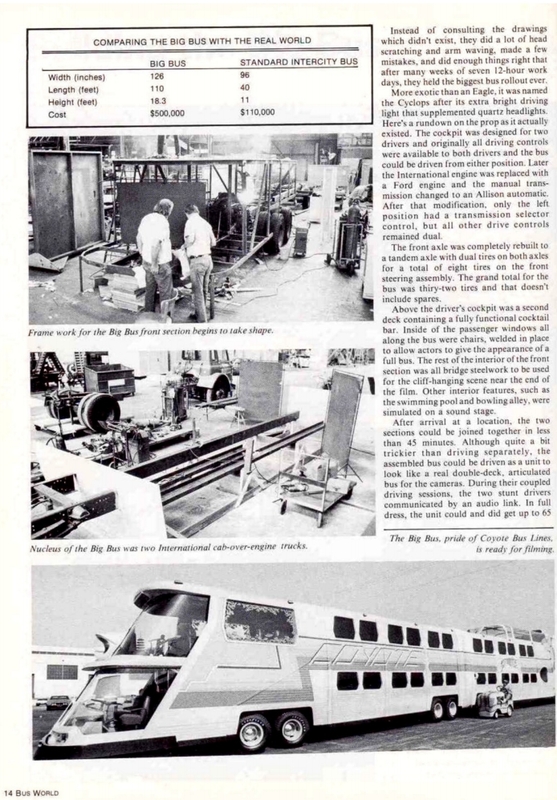 The Bus World article also contained extensive photos and details about the building of the bus. The article states that the rear half of the bus was a separate vehicle with a driver. The two halves of the bus would arrive separately at the filming location where they were joined together for shooting. The rear driver was unable to see and had to be directed by radio. In the scene in which the bus departs the terminal on its voyage, the front wheels on the rear portion of the bus are seen turning independently as the bus makes a very tight turn out of the terminal. According to car enthusiast web site Jalopnik.com, the bus was scrapped after filming. In the closing credits, Trailways Bus Lines is thanked for their help in creating the bus used in the film. It is not stated what role Trailways took in creating Cyclops, although the footage of passengers boarding the bus in New York used Trailways Los Angeles bus station. The fictional bus line in the film that operates Cyclops is Coyote Bus Lines, a parody of Greyhound Lines. The score to the film was created by veteran film composer David Shire. Shire is also credited with composing scores for such films as The Hindenburg, The Conversation, and Short Circuit. Shire's score for The Big Bus was in line with the disaster parody theme of the film that also incorporated elements of disco. In the '90s, Film Score Monthly magazine ran a poll asking which film score its readers would most like to see released. The Big Bus was among the top 20 scores. In 2000, a bootleg CD of the film's soundtrack surfaced as a prized collectable. In January 2011, a limited edition official release of the score was produced by Film Score Monthly (Catalog No. FSM1401). The compact disc was limited to 2000 copies and contained the film's complete score, including alternate takes and excerpts of classical pieces used in various scenes. The CD also contained comedy music and vocals bits by Murphy Dunne, who portrayed Tommy Joyce, the piano player in the bus' Oriental Lounge. The soundtrack release was sourced from the master tapes. As a result, sound quality was excellent and in stereo. The film was released to VHS and Betamax in the early 1980s. Copies for those formats are extremely hard to find. In 2002, Paramount Home Video released the film on DVD in a dual-format edition containing the film in the full-screen or theatrical 2.35:1 aspect ratios, (though there is some slight windowboxing with the widescreen version selected); Dolby 5.1 English Surround Sound stereo/mono mix, or Dolby 2.0 mono in English, French, and Spanish. No other extras are included. As of September, 2013, the film is available on DVD in the United States from Warner Archive. Region 4 full-screen DVD releases are somewhat common though. There have been rumors that Paramount Home Entertainment is planning Blu-ray/DVD combo release containing a new remastered transfer, though no official confirmation has been made. The film made a television premiere on CBS in May 1980, albeit with edits in some adult content and language to meet broadcast content standards. It has been broadcast only a few times over the past 30 years on various channels, though it had been aired uncut as recently as early 2009 on Turner Classic Movies (TCM) and Showtime. As of 2009, Warner Bros. Television holds the USA TV broadcast rights while Paramount Pictures retains all other rights. Only the Warner Bros. logo appears on Showtime's airings and the original Paramount logo is preserved on TCM's print and the DVD issue. ^ Eder, Richard (June 24, 1976). "'Big Bus' Is Inexhaustible Film Comedy". New York Times. Retrieved August 4, 2016. ^ "My guilty pleasure: The Big Bus | Film | The Guardian". theguardian.com. Retrieved 2015-09-03. ^ "Image: page_1.jpg, (736 × 728 px)". starcarcentral.files.wordpress.com. Retrieved 2015-09-03. ^ "Image: page_2.jpg, (557 × 1063 px)". starcarcentral.files.wordpress.com. Retrieved 2015-09-03. ^ "Image: page_3.jpg, (694 × 996 px)". starcarcentral.files.wordpress.com. Retrieved 2015-09-03. ^ "Image: page_4.jpg, (702 × 965 px)". starcarcentral.files.wordpress.com. Retrieved 2015-09-03. ^ "The "Big Bus" Was Scrapped, But You Can Read All About It". jalopnik.com. Retrieved 2015-09-03.